The 2011-12 financial year was characterised by strong performance against the organisation’s strategic and operational objectives, with an increasing volume and quality of whole-of-State, client and internal outcomes, achieved against a background of ongoing volatility and uncertainty in the global financial markets. The Queensland Treasury Corporation Annual Report 2011-12 provides details of Queensland Treasury Corporation’s (QTC’s) achievements, outlook, performance and financial position for the 2011-12 financial year. QTC uses its financial markets expertise, enhanced by b relationships with the domestic and international markets, together with its understanding of debt management and the management of financial risk, to provide clients with investment solutions that achieve a high return within a conservative risk environment. Clients can choose from an overnight facility, a managed short-term fund or fixed-term facility. Alternatively, we can assist them to source appropriate solutions from the marketplace. I am pleased to present the Annual Report 2011-12 and financial statements for Queensland Treasury Corporation. In a year of continued uncertainty and volatility in the global financial markets, Queensland Treasury Corporation’s strength, resilience and reputation in domestic and global financial markets ensured it successfully met its revised $18 billion borrowing program, including refinancing the maturing 2012 benchmark bond and financing $10.6 billion of Queensland’s capital works. These significant achievements were made possible through QTC’s organisation-wide commitment to fulfilling its mandate to fund the State’s debt requirements and assist its public sector clients to manage financial risk in their businesses. Together with its employees’ collective expertise and experience, QTC’s commitment to achieving its mandate through whole-of-State outcomes will ensure it is well-placed to help build and maintain a stable financial platform for the benefit of all Queenslanders. Throughout the year, QTC also continued to offer a range of products to enable clients to maximise their financial outcomes within an acceptable risk framework. In May, QTC farewelled Stephen Rochester following his resignation after almost a quarter of a century of visionary leadership as QTC’s inaugural Chief Executive and then Chairman. In these roles, Stephen was responsible for the creation of the organisation’s unwavering commitment to maintaining open and transparent relationships with the global financial markets, which have ensured QTC’s position as an innovative leader in its field. He also demonstrated considerable foresight as he promoted the organisation’s whole-of-State and client-focused approach to business. On behalf of the Board, I would like to acknowledge his significant contribution and thank him for his efforts in working for, and on behalf of, the State. I look forward to working with QTC’s Board, management team and employees to build on the legacy of Stephen and our Foundation Chairman Sir Leo Hielscher AC. We will continue with our long-standing commitment to keeping our investors fully informed of funding activities, ensuring our debt products respond to financial market requirements as we deliver innovative financial risk management solutions to our clients. In the coming year, we will focus on our core funding and debt management business to ensure we meet the State’s financing requirements and contribute to a sustainable future for all Queenslanders. In 2011-12, Queensland Treasury Corporation performed bly in delivering innovative solutions for its clients and achieved an operating profit from its capital markets operations of $47 million, despite continued volatility and uncertainty within financial markets across the globe. For the 2011-12 year, QTC recorded an operating profit from its capital markets operations of $47 million (2010-11: $46 million), and attained $611 million (2010-11: $484 million) in quantifiable savings for clients and the State through access to funding via our capital markets activities and economies of scale. This operating profit was achieved despite an increase in operating expenses due to the impairment of software development costs, an increase in demand for QTC’s services over the past three years, and costs to deliver a significant number of information technology initiatives during the year. Separate to QTC’s capital markets operations, the long-term assets segment recorded a profit of $187.2 million (2010-11: $1.2 billion). The long-term assets segment is managed by QIC Limited and comprises the investments that fund the State’s defined benefit superannuation and other long-term obligations. These assets were transferred to QTC by the State Government under an administrative arrangement. While fluctuations in the value and returns on the asset portfolio are borne by QTC, there is no cash flow effect for QTC and any accumulated losses incurred by this segment have no impact on QTC’s capacity to meet its obligations or its capital markets activities. Volatile economic and financial market conditions continued around the world, as several weaker-than-expected growth outcomes led the market to question the outlook for the global economy. This uncertainty was accentuated by adverse developments within Europe, and resulted in frequent periods of market instability. These concerns are unlikely to dissipate in the near future, posing sustained challenges in our market environment into the next financial year. Heightened market volatility continued across the globe over the course of the financial year, resulting from the ongoing financial and economic crisis and, in particular, the European sovereign debt crisis. More than three years after the end of the Global Financial Crisis, this unusually high level of uncertainty reflects not only the large number of structural problems affecting the global economy, but also the fact that there is currently little indication as to how quickly or adequately these problems will be resolved. Within the context of this profoundly shifting and challenging operating environment, the ongoing caution of our traditional investor base and factors flowing from investor market constraints saw continued volatility in the pricing of semi-government credit spreads relative to the Australian Government. Despite the global market challenges of the past year, Queensland’s medium-term economic prospects appear stable, given the State’s involvement in meeting the resource and energy needs of its major trading partners. With many of these partners located in the fast-growing Asia Pacific region, and with the industrialisation of these economies continuing into the near future, additional investment and revenue flows into the State economy can be anticipated to provide a foundation for ongoing stability. QTC has also sought innovative solutions to managing this challenging economic environment, and became the first semi-government issuer to add the United States’s 144A capability to its domestic Australian dollar benchmark bond program, benefiting our US investors and enhancing liquidity in our benchmark bonds for all investors. Additional innovations stemmed from close liaison with our clients and the State to drive improvements in the management of interest rate risk, refinancing and future borrowing requirements. Our principal source of funding—QTC’s AUD benchmark bond program—now provides investors with a choice of nine benchmark bonds with various terms to maturity, with an average of $6 billion outstanding in each line. Investors are able to switch between bonds of different maturities and obtain competitive market pricing from the 15 global bank members of our Fixed Interest Distribution Group. During 2011-12, we issued a 2021 Benchmark Bond as we continued to build our domestic yield curve. QTC maintains a range of funding facilities so that a variety of debt instruments can be issued to meet investors’ needs from long-term fixed rate bonds (public and private placements) to commercial paper in a variety of currencies. As we look ahead, our challenge will be to achieve our objectives for the State in terms of cost-effective funding within an environment of continued global economic and financial uncertainty. QTC’s key priority will be its commitment to the ongoing sustainability of the Queensland economy, sourcing competitively priced debt funding and proactively delivering innovative solutions to manage the stability of our State’s financing requirements, and contribute to a sustainable economic platform for the future of Queensland. Throughout the year we worked closely with our clients at both the State and local government levels to deliver significant benefits through the provision of tailored funding solutions and a wide range of financial and risk management advice. The results of our 2012 Client Survey were particularly pleasing, with our clients responding positively to our efforts to engage with them and add value to their businesses. The client focus and flexibility of the QTC operating model has allowed us to respond to the significantly changing needs of Government following not only the State election, but also local government elections, at which there was a significant turnover of council political leadership. QTC is committed to providing its clients with the best advice and solutions to assist them to respond to emerging issues and meet their planned objectives, thereby adding value to their business and the broader economic position of the State. Over the past few months, QTC has conducted an ambitious client relationship meeting schedule across the breadth of the State to meet with newly appointed senior officers to understand their needs and determine how QTC can assist in delivering their priorities. The flexibility of QTC’s operating model has been demonstrated this year through our capacity to provide immediate resourcing to meet the financial and risk management needs of our clients. Our expertise has been sought across a number of major client projects and initiatives that required unique solutions to complex financial and funding issues. Of particular note has been our contribution of significant resources and expertise to Treasury’s ‘Projects Queensland’ initiative to analyse and deliver public sector infrastructure, as well as the Government’s major independent review of Queensland’s current and future financial position. In the coming year, we will continue to roll-out our significant program of educational forums, focused on our core strengths of finance and risk management, to help enhance the skills of recently elected and appointed officials, and we will continue to strengthen our client relationship management practices to ensure both our own and our partners goals are achieved. A priority for QTC has been the attainment of increased efficiencies across the organisation. We have worked to generate improved synergies across our work practices, particularly through the co-location of all our employees into one accommodation space, and upgrades and enhancements to our existing business systems and internal processes. In December, we took the difficult decision to review the strategic direction of our major program of work to deliver improved online services that would streamline processes and provide greater client value. With a renewed strategic focus and using in-house resources, this project has since achieved its first major milestone and we anticipate significant benefits to both our organisation and our clients as the project reaches completion by the end of 2012. Our commitment to our people and their growth and development remains a key priority, as their skills and expertise underpin everything we do and are critical to our ability to service clients and meet the priorities of the State. Together, we have worked hard to build team capacity, enhance skills and engage our employees and, on behalf of the management team, I thank our team of experts, whose talents and skills have been our strength in delivering unique financial solutions in what has often been a challenging and complex environment. Throughout the year, QTC also experienced changes at the Board level, including the resignation of Stephen Rochester as Chairman. Stephen’s leadership as both Chief Executive and Chairman of QTC over a period of 22 years saw the organisation through its establishment, development and evolution to the QTC of today, and I would like to acknowledge his significant contribution. As we move into a new era for our organisation and the State, we have been privileged to welcome our new Chairman, Gerard Bradley, whose extensive experience as the former Under Treasurer of Queensland provides us with a b foundation for the future. With Mr Bradley at the helm of our Board, QTC is well placed to work with its partners to drive financial sustainability, and create and deliver value for Queensland’s public sector organisations. In the challenging global financial markets, QTC achieved its final borrowing requirement of $18 billion. The original estimated requirement of $22 billion for the year was revised down to $19.2 billion following the Government’s Mid-Year Fiscal and Economic Review, which was released in January 2012, and was further reduced by year-end following advanced payments by the Australian Government of some natural disaster funding and reduced client requirements. Funding activities were impacted by heightened global market volatility, as increasing investor caution reduced market appetite for most non-sovereign asset classes, including semi-government bonds. Given QTC’s borrowing program for the year was the largest of all of the Australian states and territories, supply concerns also contributed to ongoing volatility in bond spreads. Our success in achieving our borrowing program is directly attributable to our long-term commitment to engaging with investors—via our market intermediaries, QTC’s Fixed Interest Distribution Group—and proactively seeking opportunities to differentiate ourselves from our peers. We continued to pursue opportunities to diversify funding options for investors, and secure reliable funding sources for our clients. In February, QTC became the first semi-government issuer to add the United States of America’s ‘144A capability’ to its domestic AUD benchmark bond program, providing US investors with immediate access to QTC bonds at primary issuance and enhancing liquidity in QTC’s benchmark bonds for all investors. Across our funding activities, we achieved total quantifiable savings to clients of $611 million, and successfully completed approximately 83,000 transactions and $1.3 trillion of turnover of funds. switching the evaluation of bonds from the Australian Government Guaranteed (AGG) to the State Government Guaranteed (SGG) yield curve to ensure funds continue to be lent to clients equitably and on a full cost-recovery basis. Development also continued on the online system that will offer clients greater efficiencies by allowing them to undertake day-to-day management of their own borrowing requirements. QTC continued to offer a range of products to enable clients to maximise the value of surplus funds, primarily its flagship Capital Guaranteed Cash Fund, which outperformed its benchmark, the UBS Australian Bank Bill Index, by 59 basis points. collaborating with the Department of Local Government and the Local Government Association of Queensland to deliver a series of training events designed to enhance the capabilities of elected officials, including a State-wide program of new councillor seminars and a financial summit to promote financial sustainability in local government. Early in the year under review, we joined with Treasury to establish the Infrastructure Project Assessment Team (IPAT) to maximise opportunities for private investment in public infrastructure. IPAT completed a number of critical assessments of private funding options to support decisions around major projects including mining-related water and transport infrastructure and the athletes’ accommodation for the Gold Coast Commonwealth Games. Following the Government’s announcement of the creation of the Projects Queensland unit in Treasury in June 2012, the IPAT joint initiative concluded and QTC seconded a number of its senior staff into Projects Queensland to support its enhanced Government mandate for involvement in significant public sector infrastructure projects. In line with our operating philosophy to partner with our clients to achieve improved financial outcomes for their organisations and the State, we have continued to commit considerable resources to supporting the State’s public sector organisations, including the newly-elected State and local government representatives, in their financial and risk management activities. This commitment has led to further enhancements in our clients’ loyalty to our organisation; our 2012 client survey found 38 per cent of respondents displayed a very high level of commitment to QTC (above our 2011-12 target), while an additional 42 per cent had a high level of commitment (on par with our longer-term 2015 target). Our client loyalty sentiment ratings were also b at 8.2 out of 10 (above target), with 95 per cent of respondents expressing positive or extremely positive sentiment towards QTC. QTC’s Best Practice Pricing and Financial Sustainability Model for water and sewerage operations, which was cooperatively developed with the Townsville, Cairns, Toowoomba and Mackay councils, won the Asset and Financial Management category at the 2011 National Awards for Local Government. The Awards recognise the innovative work of local governments, showcasing unique local solutions to common problems. LGIS received recognition for its program management expertise, including a prestigious international ‘Landmark’ award recognising pioneering social marketing and a ‘highly commended’ award from the Institute of Public Administration Australia for Best Practice in State Government. It was also a finalist in the Premier’s Awards for Excellence in Public Service. QTC’s enterprise-wide risk management framework supports the achievement of strategic objectives by ensuring risks are effectively identified, evaluated, managed and reported using a consistent and well-understood approach. During the year in review, an improved Risk Appetite Statement was approved by the Board, which clearly defines QTC’s appetite for risk and provides clear organisational definitions on risk tolerance in setting and understanding its key strategic and business objectives. Our processes for risk review, monitoring and reporting practices were also enhanced to reflect changes in our current business operating environment. As part of a triennial requirement, QTC undertook a liability portfolio management and market risk management review. Recommendations from this review were assessed and a process is underway to implement necessary recommendations. Board level reporting of risk matters was also streamlined, with an improved risk governance framework implemented at the Board level to enhance reporting on market and operational risk. Tailored and structured amendments to certain financial markets policies were also completed. With increased market volatility and the downgrading of many financial institutions across the globe, counterparty credit limits were actively monitored, with a reduction in exposures to Europe. These risk management framework improvements enhance QTC’s ability to effectively achieve its key strategic and business priorities. In a climate of increasing risk in the financial markets, we will continue to review our risk processes and practices over the forthcoming year, to protect the integrity of our risk management environment and support our business objectives. The achievement of our corporate goals is built on the commitment and efforts of our people. The past year featured a b focus and effort on our people and culture, particularly around building capability and improving employee engagement, communication and recognition. During 2011-12, we progressed action plans to address opportunities for improvement identified through an organisation-wide employee engagement survey undertaken in early 2011. The action plans respond to four key priority engagement areas: performance management; career development; recognition; and employee value proposition. As a key initiative in the action plans, we have embarked on a program to improve our performance management processes across organisational, individual and team performance, to ensure the alignment of employees to corporate and team objectives. A process to embed and foster recognition of corporate values is also underway, with the forthcoming introduction of an employee recognition program, which acknowledges behaviour or effort that consistently supports the organisation’s values. As part of QTC’s ongoing commitment to its people, strengthening QTC’s leadership and management capability remains a priority. Over the review period, a tailored management capability and effectiveness program was delivered, focusing on the enhancement and development of practical leadership skills in the areas of managing performance, career development and recognition. This program builds on the capacity of QTC’s people managers to lead and develop employees. Through a renewed commitment to cross-organisational learning and development initiatives, we promoted opportunities to grow and transition our people. Structured learning and professional development programs and experiences provided further development opportunities, while significant progress was made to enhance and reinvigorate our learning and development culture to ensure the learning programs were achieving the best possible outcomes. This includes the redevelopment of QTC’s learning and development framework that enables, supports and facilitates the implementation of QTC’s strategic direction and priorities. Building on our client-centric business model and our organisational sustainability and capability, focus was also placed on addressing skills gaps; enhancing induction processes to support learning pathways of new and existing employees; continued development of client relationship management skills across the organisation; and the development of key technical and professional capabilities required to undertake our core business and ensure organisational effectiveness. Looking forward, QTC will continue to further embed its organisational values through strategies that focus on the optimisation of employee engagement and the building of leadership capacity, with additional people management processes and toolkits to support managers, and targeted development programs and succession planning strategies that develop QTC’s future leaders. QTC’s commitment to operational efficiencies continued throughout the year as systems and processes were assessed to bring greater benefits to the organisation and its clients. A key initiative was the rationalisation of our existing accommodation arrangements to colocate all employees in one building and provide greater efficiency in the use of space and organisational productivity. Further productivity benefits were also achieved through enhancements to existing internal processes and the implementation of a number of improvements to our existing business systems. QTC is committed to continuous improvement in the way it conducts its business and its capacity to add value in the services provided to clients. During the year, QTC revisited its project to deliver improved online services, refocusing the project to ensure the attainment of its core objectives, including the delivery of greater client value and improved organisational efficiencies. Work on this project will be completed by the end of 2012. QTC has an intrinsic link with the State of Queensland as all of its debt securities’ and derivatives’ obligations are unconditionally guaranteed by the Treasurer of Queensland, on behalf of the State Government. Since 1988, QTC has funded the Queensland Government’s public sector capital works programs and remains an important part of Queensland’s economic growth story. QTC continues to maintain a high-quality asset portfolio of public sector loans and investments, with a loan portfolio covering more than 200 Government clients — all underpinned by Queensland’s AA+ credit rating. QTC’s principal source of funding—QTC’s AUD benchmark bond program—provides investors with a choice of nine benchmark bonds with various terms to maturity and an average of $6 billion outstanding in each line. Investors are able to switch between bonds of different maturities and to obtain competitive market pricing from the 15 global banks that make up our Fixed Interest Distribution Group. During 2011-12, we issued a 2021 Benchmark Bond as we continued to build our domestic yield curve. In spite of the challenging international backdrop in the fiscal year, QTC successfully met its revised $18 billion borrowing program, which included refinancing the maturing 2012 benchmark bond and financing Queensland’s $10.6 billion capital infrastructure program. QTC maintains a range of funding facilities so that a variety of debt instruments can be issued to meet investors’ needs from long-term fixed rate bonds (public and private placements), to commercial paper in a variety of currencies. Investors located in the United States now have access to QTC benchmark bonds at primary issuance (rather than having to wait the usual 40-day seasoning period) with a US Rule 144A capability added to the domestic $A benchmark bond program in February 2012. This extension to the program is a result of QTC’s commitment to diversify its funding program so that investors have a greater choice of debt securities and it also enhances liquidity in existing bond lines for all investors. To better understand investors’ needs and to build b partnerships in the markets, QTC is committed to engaging with investors and financial market intermediaries, both in Australia and globally. Providing regular comprehensive updates on Queensland’s economic and fiscal position and QTC’s planned funding activities and annual borrowing requirements is one of QTC’s key funding principles. Throughout the year, we partnered with a number of our Fixed Interest Distribution Group member banks to provide global institutional investors with the opportunity to visit central Queensland and see first-hand both the extensive capital works program being funded and the State’s potential for b economic growth. These visits also enabled investors to learn more about the Australian fixed income market in general and QTC’s debt securities more specifically. QTC has a diverse range of funding facilities to ensure access to funds in a variety of markets and currencies. Between 90 to 95 per cent of QTC’s funding is sourced through long-term debt facilities, with QTC’s AUD benchmark bonds being the principal source of funding. Funding is undertaken in advance of requirements as per policy, and hedged using high credit quality assets of similar maturities. 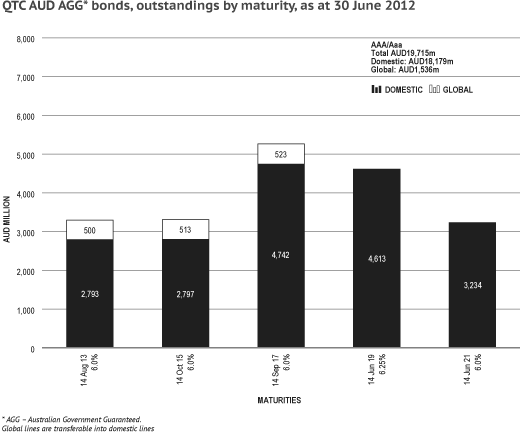 In order to continue to build our domestic yield curve, a 2021 AUD benchmark bond was issued in July 2011. 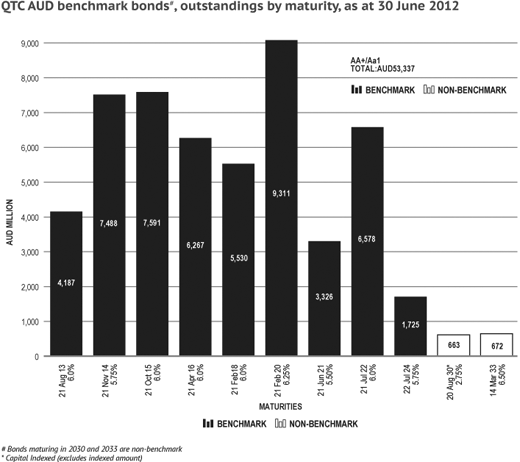 QTC’s April 2012 benchmark bond matured during the fiscal year. All benchmark bond lines guaranteed by the Australian Government will remain covered by this guarantee until maturity or retirement. These bonds are rated AAA/Aaa by Standard & Poor’s and Moody’s Investor Service respectively. The Guarantee was closed to new issuance after 31 December 2010. QTC provides investors with a choice of nine benchmark bonds, ranging in maturity from 2013 to 2024. QTC has significant depth in Australian fixed income market. Based on current fiscal estimates, the volume of QTC benchmark bonds is expected to increase over the forward estimates period. The payment of grants, which accounts for approximately 50 per cent of Queensland’s revenue. The Horizontal Fiscal Equalisation scheme, which seeks to reduce the revenue-raising and cost disparities between the Australian states and territories. The Australian Government’s National Disaster Relief and Recovery Arrangements, which provides reimbursement for eligible costs for natural disasters. These arrangements are currently providing Queensland with 75 per cent reimbursement for all eligible costs relating to the 2010-11 natural disasters. Following the release of Queensland’s State Budget on 11 September 2012, QTC estimates its total 2012-13 borrowing program to be $18.7 billion, which is $3.2 billion lower than the previous $21.9 billion forecast. The decrease in the borrowing requirement reflects the Government’s commitment to reduce expenditure and to achieve a fiscal balance in 2014-15. The total term debt requirement is $13.7 billion. As a result of the Budget release being deferred due to the change of Government in March, QTC has already borrowed $3 billion in term debt this fiscal year, leaving a balance of $10.7 billion. In addition to the total term debt requirement, QTC expects to maintain between $4 billion and $5 billion in short-term debt throughout the fiscal year. Our Fixed Interest Distribution Group of 15 Banks is committed to making two-way pricing in the secondary market for our bonds, as well as supporting our primary issuance activity. QTC is committed to maintaining high standards of corporate governance to support its strong market reputation and ensure that organisational goals are met, and risks are monitored and appropriately addressed. QTC and the Board have agreed the terms and administrative arrangements for the exercise of the powers that have been delegated to the Board by QTC (as the corporation sole). The Board comprises seven directors who are appointed by the Governor-in-Council, pursuant to section 10(2) of the QTC Act, with consideration given to each Board member’s qualifications, experience, skills, strategic ability, and commitment to contribute to QTC’s performance and achievement of its corporate objectives. QTC’s Chairman is a non-executive director, and the Board is entirely constituted of non-executive directors. To ensure continuous improvement and to enhance overall effectiveness, the Board conducts an annual assessment of the performance of the Board as a whole. Board members’ remuneration is determined by the Governor-in-Council (details are disclosed in QTC’s financial statements). The Board has established three committees, each with its own terms of reference, to assist the Board in overseeing and governing various QTC activities. 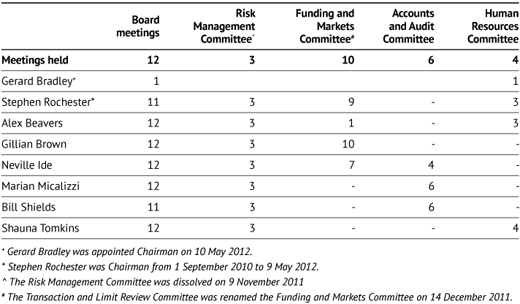 During the year, the Board dissolved the Risk Management Committee and also changed the terms of reference of the Transaction and Limit Review Committee and renamed it the Funding and Markets Committee. The achievements of the Accounts and Audit Committee during the year included recommending the adoption of the half year and annual financial statements, reviewing external and internal audit reports and the progress in implementing the recommendations from those reports, and reviewing the Queensland Audit Office’s Client Service Plan and the Internal Audit Plan. During the year, the Board agreed to change the terms of reference of the Transaction and Limit Review Committee and rename it the Funding and Markets Committee. Gillian Brown has more than 20 years’ experience as a specialist finance lawyer and has gained extensive corporate, financing and major project experience. She is a partner of Minter Ellison Lawyers in Queensland, heading the finance practice, and is a past Chairman of that firm. Ms Brown’s principal areas of practice include corporate finance, investment and financial services, financial markets, project and infrastructure finance, and property finance. Ms Brown has advised government bodies on a number of project and transactional arrangements and has an in depth knowledge of the mechanics of government and its objectives. Ms Brown is a director of the Australian Rail Track Corporation Limited (from 30 June 2010) and a committee member of the Law Council of Australia. Neville Ide’s experience in the financial services industry spans more than 28 years. Starting at the Commonwealth Bank of Australia as a Senior Treasury Dealer, Mr Ide’s career extends from the Treasury Department of the Queensland Government as a Senior Financial Analyst, to General Manager of QTC’s Financial Markets group for 12 years, and then to Suncorp Metway as its Group Treasurer. He brings in-depth knowledge of the inner-workings of QTC’s funding and markets function coupled with extensive corporate commercial experience of liquidity management, debt funding, capital management and balance sheet risk management. Mr Ide is also a Non-Executive Director of RACQ Insurance Ltd, a Non-Executive Director of the Queensland Professional Credit Union Ltd, and an advisory Board member of ONE26 Pty Ltd.
Marian Micalizzi is a chartered accountant with more than 20 years’ experience, a company director and a consultant in both the public and private sector. She is a former partner of PricewaterhouseCoopers, with considerable expertise and knowledge of specialist corporate financial and advisory services, financial institutions’ regulation and prudential supervision, and valuation related assessments. Ms Micalizzi is also a director of the Australian Reinsurance Pool Corporation; and a member of Corporations and Markets Advisory Committee, the Independent Investment Committee of Queensland Development Fund, the Sunsuper Audit, Risk and Compliance Committee, and the Cancer Council’s Management and Finance Committee. She is also a Governor of the World Wildlife Fund, Australia. Mr Shields was previously Chief Economist and Executive Director of Macquarie Bank Limited (1987–2001), and he has also held positions with the Reserve Bank of Australia (1983–1985), the International Monetary Fund (1973–75 and 1977–83), and the Australian Treasury. He was a Visiting Professor at the Macquarie Graduate School of Management of Macquarie University from 2001-09 and has recently taught at the Australian Catholic University in Brisbane. He is currently a director of the Sydney Anglican Schools Corporation (and is Chair of its Education and Strategic Development Committee and a member of the Governance Committee). Shauna Tomkins is a principal of Promontory Financial Group Australasia and works internationally in the development and implementation of regulatory frameworks for prudential supervision and corporate regulation of deposit-taking, funds management, insurance and lending institutions. Ms Tomkins has a thorough understanding of Australia’s financial system, risk management analysis, prudential supervision, and corporate and structured finance. She has specific expertise in long-term policy and strategic management and planning, and has an in-depth understanding of government objectives and processes. Ms Tomkins is also a member of the Advisory Committee to Queensland’s Motor Accident Insurance Commission. In the year under review, KPMG completed its internal audits in accordance with the approved annual audit plan. The internal audit function had due regard to Queensland Treasury’s Audit Committee guidelines. In the 2011-12 financial year, the Queensland Audit Office conducted various audits, including a follow-up audit on Network Security, an audit of IT Governance and Disaster Recovery and an audit of the project for the implementation of new online services software. The LTAAB holds meetings at least four times per year. The model provides a five-step process that helps employees focus their efforts and provides a consistent framework for filtering, assessing and prioritising client opportunities and planning appropriate resourcing. QTC’s organisational structure supports the operating model and achievement of the organisation’s strategies creating alignment throughout the organisation, linking appropriate staff expertise and accountabilities to the client value-creation process. The responsibility for the day-to-day operation and administration of QTC is delegated by the Board to the Chief Executive and the executive team. The Chief Executive is appointed by the Board. Executives are appointed by the Chief Executive. As with the Board, all executive team appointments are made on basis of qualifications, experience, skills, strategic ability, and commitment to contribute to QTC’s performance and achievement of its corporate objectives. QTC’s people strategy recognises the importance of valuing and developing staff to foster the sustainability of its organisational capability and the potential of its people. Integral to QTC’s broader corporate objectives and organisational success, QTC’s people priorities ensure that a workforce with the right mix of people and skills exists. Continually raising the standard of leadership, embedding our corporate values and investing in our staff potential and well-being drive our organisation’s attraction and retention strategies and employee engagement, to build and sustain organisational capacity. our hosting of talented finance students, where they are offered real work opportunities for a short term. A review of QTC’s employment terms and conditions was also undertaken in 2012. This did not result in any major change to the organisation’s contractual provisions or employment benefits. All QTC employees are employed subject to the Fair Work Act and are governed by individual employment agreements. QTC is required to make various disclosures in its Annual Report. QTC is also required to make various disclosures on its website in lieu of inclusion in its Annual Report. This Appendix sets out those mandatory disclosure statements that are not included elsewhere in the report or made available online via our website, www.qtc.com.au. QTC employees are required to comply with QTC’s Code of Conduct for employees, which aligns with the ethics principles and values in the Public Sector Ethics Act 1994, as well as the Code of Ethics and Code of Conduct established by the Australian Financial Markets Association, of which QTC is a member. Both codes are available to employees via QTC’s intranet. Copies of these codes can be inspected by contacting QTC’s People and Performance Group (see Appendix D for contact details). Appropriate education and training about the Code of Conduct has been provided to QTC staff. For the year ending 30 June 2012, total remuneration payments made to the members of the Queensland Treasury Corporation Capital Markets Advisory Board was $389,043 and the total on-costs (including travel, accommodation, and hiring of motor vehicles for the members) was $39,604. 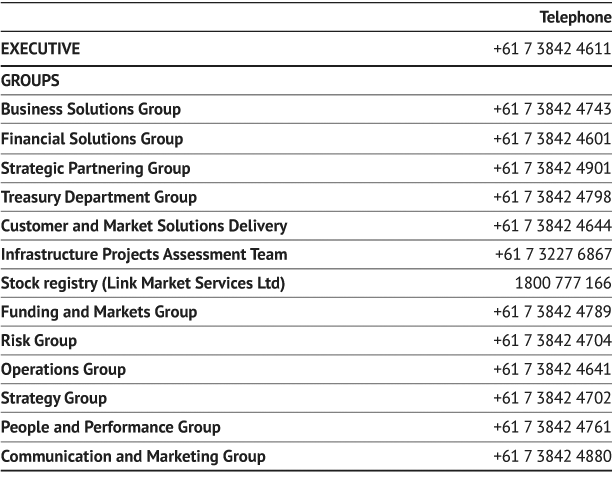 No payments in relation to remuneration or on-costs (including travel, accommodation, and hiring of motor vehicles for the members) were made to members of the Long Term Asset Advisory Board in the year ending 30 June 2012. Australian Government Guarantee (AGG): Also known as the Commonwealth Government Guarantee. The Global Financial Crisis had an adverse effect on the state government bond market and threatened the capacity of state governments to deliver critical infrastructure projects. In response, on 25 March 2009, the Australian Government announced that it would provide a time limited, voluntary guarantee over Australian state and territory government borrowing, available for both existing and new issuances of securities over a range of maturities. 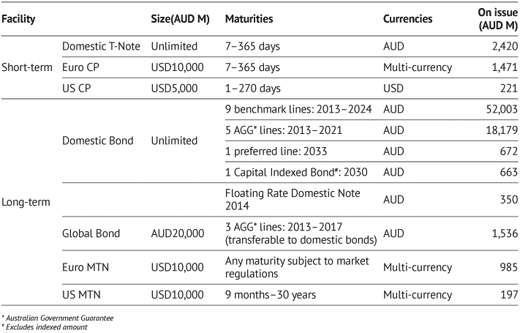 On 16 June 2009, the Queensland Government announced it would take up the Australian Government’s offer of the guarantee on all existing AUD denominated benchmark bond lines (global and domestic) issued by QTC with a maturity date of between 12 months and 180 months (1-15 years). On 18 September 2009, the Reserve Bank of Australia (RBA) approved QTC’s application for the Australian Government Guarantee to be applied to selected AUD Domestic Benchmark bonds. On 11 December 2009, the RBA approved QTC’s application for the Australian Government Guarantee to be applied to selected AUD Global Benchmark bonds. The AGG was withdrawn for new borrowings after 31 December 2010. Bond: A financial instrument whereby the borrower agrees to pay the investor a rate of interest for a fixed period of time. A typical bond will involve regular interest payments and a return of principal at maturity. CP (commercial paper): A short term money market instrument issued at a discount with the full face value repaid at maturity. CP can be issued in various currencies with a term to maturity of less than one year. Queensland Treasury Corporation’s annual reports (ISSN 1837-1256) are available on QTC’s website at www.qtc.com.au/qtc/public/annual-reports. If you would like a copy of the report posted to you, please call QTC’s Communication and Marketing Group on +61 7 3842 4880. The compliance checklist outlines the governance, performance, reporting and other specific requirements for annual reports in accordance with the ‘Annual report requirements for Queensland Government agencies: Requirements for the 2011-2012 reporting period’.